You’re traveling to the Galapagos Islands! Be prepared because the Galapagos Islands are unique and special – unlike any other place on Earth. This post provides you with some of the practical information every traveler to the Galapagos Islands should know: the weather, what to pack, our currency, and other general information that will help you prepare to make your trip as seamless as possible. With the exception of hotel and ship board amenities and delicious food, you are leaving big city life behind. You will travel to places where things are not the same as they are back at home. Here, things are understated, not fancy. They are designed for relaxation and enjoyment. 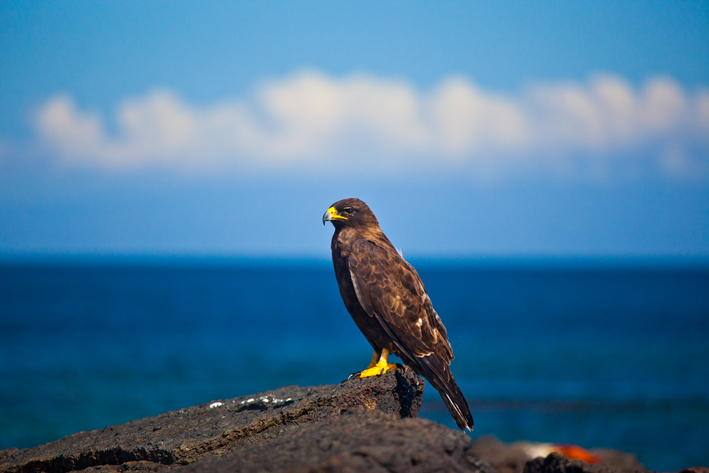 Nature, not materiality, is the focus of your time in the Galapagos Islands. Our culture differs from yours in many ways. Be prepared for some trade offs. For example, in exchange for maintaining our environment (land, sea and air) in as pristine a way as possible and for protecting our plant, animal and marine life, we limit land use, energy and water consumption and even the number of people and boats. If you find that your hotel room is a little smaller than expected, remember the land use limitations that bind us. And also, remember that it is because of these regulations that you will marvel at sea lions lounging not only on the beaches, but also on Main Street, Blue Footed Boobies dive bombing into the Pacific Ocean and stunning pure blue skies. Let me give you a few facts to keep in mind during your stay here. You will be in a National Park where everything is regulated and overseen. See my post on these regulations here. You will be expected to comply with these rules at all times, where ever you are. All flora and fauna is protected. The amount of land one may own is limited, building sizes are restricted. Water and electricity are rationed. You are likely to be asked to be aware of conservation during your stay here. Until just a few years ago, there was no internet here. Though the large cities now have internet service, and even wifi, prepare for it to be erratic. Our communications systems and technology are not as sophisticated as they are back home. Because we are a distant set of islands, everything is expensive as it has to be flown or shipped here. Hotels and boats must comply with very strict regulations. Remember, this is not New York City! Most hotels try to give you a sense of our customs and the ambiance of the Galapagos Islands so as to immerse you in our culture. Throughout Ecuador you will see dogs, roosters and chickens seemingly on their own. The National Park Service is working on this, but don't let it be a surprise. Enjoy your stay in the Galapagos Islands. When you are here, we want you to experience and become a part of the wonderful Paradise we call our home. But most of all, allow yourself the luxury of experiencing our culture and special "quirks" and trends. Your stay will be most enjoyable if you "go with the flow." You may experience vastly different climates during your visit. While we are located on the equator, often it is not as hot as you might expect it to be. Sometimes the temperatures are unpredictable. In the higher altitudes on the mainland, particularly Quito, it may be 50º F. At the same time, it may be 100º F in the Galapagos Islands. Plan for both extremes. It is coldest with the heaviest seas in the summer months of June, July and August. It is warmest with the calmest seas in January, February and March. This is all due to the currents that run throughout the Pacific Ocean. To learn about the currents and how they effect our weather see my earlier post. Here in the Galapagos we have basically two seasons. It is dry and cool (never cold) from June through November, with a constant mist called “garua.” It is more warm and humid from December through May. During the cooler season, the Pacific Ocean is cooler as well, but the Galapagos Marine Reserve is bustling with activity. Both are excellent seasons to visit because the plant, animal and marine life all change with the seasons. Many visitors travel to Galapagos more than once so that they can experience the seasonal changes themselves. In June through November, the Galapagos Islands experience cooler temperatures and mistier weather. In this period, the average outdoor temperature ranges from 70-75 degrees, with July tending to be the warmest month. The average water temperature in this period ranges from 70 to 73. In December though May, the Islands experience warmer temperatures and drier weather. In these months, the average outdoor temperature ranges from 74 in December to 83 degrees in March and April. The average water temperature in these months ranges from 74 to 77 degrees. Where are the Galapagos Islands? The Galapagos Islands are located 600 miles west of the coast of Ecuador in the Pacific Ocean. The islands are found at the coordinates 1°40'N–1°36'S, 89°16'–92°01'W. Straddling the equator, islands in the chain are located in both the northern and southern hemisphere, with Volcán Wolf and Volcán Ecuador on Isla Isabela being directly on the equator. Española, the southernmost island, and Darwin, the northernmost island, are spread out over a distance of 220 km (137 mi). You will travel by plane to continental Ecuador, either to Quayaquil or Quito. Guayaquil's (GYE) airport receives flights from U.S. cities of Miami and New York, European cities of Amsterdam and Madrid, and major cities of Central and South America. Quito's (UIO) airport receives flights from the U.S. via Atlanta, Houston, Miami, and New York; from Europe via Madrid and Amsterdam; and from many major cities in Central and Southern America. There is a lot to do on the mainland in Ecuador before or after your Galapagos Island trip so you may want to plan your travel plans accordingly. Often, your cruise travel agent will have a hotel in mind for you; check that before making a separate hotel reservation. In early 2013, Quito opened a new airport. The old airport was right next to the city. Now there is a drive from the airport into the city if you have plans to go sight seeing there. If your hotel is in the city, make sure to leave plenty of time to return to the airport for your flight to the Islands. The traffic can be problematic. If you are going on a boat trip, your tours generally will start on Saturday or Sunday (although recent changes allow mid-week itineraries as well). Of course, you might not be taking a boat trip at all or you might want to combine your cruise with some time in a hotel. The Galapagos Eco-Lodge offers tour packages and day trips for snorkeling, hiking, boating, sight seeing and more, giving you the option to stay on land and experience some Galapagos local culture at night. This is the way many guests choose to visit Galapagos. For more information on the Galapagos Eco-Lodge hotel and its travel and tourism packages for visitors, take a look at our website, Galapagos Eco-Lodge.net. There are daily early morning flights directly to the Galapagos Islands, either Baltra or Puerto Baquerizo Moreno on San Cristobal. Where you land will be determined by your Galapagos Island trip itinerary. TAME, AEROGAL and LAN airlines operate these routes. Flights from Quito usually stop in Guayaquil on their way to the islands. There is only one guideline for clothing: For traveling in the Galapagos clothing ranges from informal to very informal. There is a per person weight limit of 44 pounds (20 kg) of luggage to the Galapagos Islands. If you are staying at a hotel in Quito or traveling outside of the Galapagos Islands, you may want to consider arranging to leave non-Galapagos items at your hotel. It’s a good idea to have a small extra bag to fold into your regular luggage for this purpose and to accommodate anything you might buy and accumulate during your trip. Sneakers or walking shoes for dry landings and hiking on sand, lava, boulders and volcanic rock and compacted ash. Having an ample amount of tread is important. On the cruise ships, usually walking sticks are also available to help you with your balance. Waterproof shoes such as Tevas for wet landings on beaches. Shoes with toe protection are best because you also will use these on some of the rocky trails. Sandals or other casual shoes for evening on the boat or in town, although some passengers never put shoes on when they are on a the boat. The shoes you wear on the island visitor sites may not be worn on the boat because of cross contamination, so do plan on bringing an extra pair. Shorts for hiking and most wet landings. This is a subjective decision as some people like to avoid the sun completely by covering their legs as well. If you choose not to bring shorts, be sure that at least some of your long pants can roll up for when you do have a wet landing. At least one pair of light-weight pants. Sometimes the hikes will take you to areas that are buggy and you may want to cover your legs. Or, you may simply want to wear long pants for sun protection. If you are a person who prefers long sleeves and long pants, pack a few of each. You can rinse them out, but the boats don't tend to have laundry service. Another thing - if you are going to Galapagos in the warm winter months (late December - early April) pack more than you will in the cooler summer months because your clothes will get wet because of the heat and humidity. Long sleeved and short sleeved lightweight shirts. Wicking shirts are the best. Many people pack only short sleeved shirts or tank tops and find that the sun on their arms is too much. It’s a good idea to prepare for this possibility. Bathing suits – some prefer two, one for swimming and one for under a wet suit. A wide-brimmed hat; consider one with U.V. protection. Wind breaker or light jacket for evenings and in case of rain. Casual clothing for evenings, such as shorts and shirts, sundresses or anything comfortable. Also a wrap or sweater for the cooler evenings when you want to go outside to look at the stars! Socks for your hiking shoes and sneakers and other personal items. Lightweight daypack or backpack. You will carry this each day of touring and hiking. Bring your own wet suit if you have it because then you will be assured a correct fit. If you don’t have your own, the cruise ships always provide for their guests and, for those staying at hotels, excellent products are available for rent in the towns on Isabela, San Cristobal and Santa Cruz. I suggest that you bring your own goggles too, including prescription ones if you have them. Flippers will be provided and because they are a little more difficult to pack, many guests who bring their own wetsuits opt to borrow these. Taking beautiful and memorable photographs will be one of the highlights of your trip to the Galapagos Islands. Make sure you bring everything you personally need to memorialize your adventure. In Ecuador the local currency is the USA (dollars). In mainland Ecuador credit cards are widely accepted but in Galapagos Islands not all boats accept credit cards, so bring cash for the bar onboard and you may want to carry some change for small items such as pay phones, water or other personal expenses you may require. Also, contact your bank to inform them of your travel plans and for specific fees that may be associated while here. In Ecuador we use 110 V electrical current; the same is used onboard the cruise ships. While on the Ecuadorian continent, there is full phone and cellular service, though you must check to see whether you can use your particular provider. Generally, it is most economical to use calling cards. Also, there are internet wi/fi cafes available. Once on the Galapagos Islands, internet service and even telephone is generally not available except in the ports of Puerto Villamel, Puerto Baquerizo Moreno and Santa Cruz, where you may have access from your cell phone with a calling card or from an internet cafe. One of the delights of being in Galapagos is removing yourself from the sound of the telephone and pull of the internet. If you do need service, make arrangements at home with your carrier. Many of the hotels, including the Galapagos Eco-Lodge, offer wifi service. To learn more about communications in Galapagos read my comprehensive post. The National Park Service charges $100 to each traveler arriving to the Galapagos Islands. The money goes towards conservation services. This fee must be paid in cash at the airport of arrival. Upon departing for the U.S., a departure tax of $25.00 from Quayaquil and $48.40 from Quito will be charged. You might want to ask your travel agent or tour company about the tipping policy before leaving for Galapagos. On most cruise ships, cash tips are given separately to the crew and to the guide. Policies differ depending on the cruise line and, of course, the level of service and your personal preference. A good rule of thumb is to figure on $15/day for the guide ($100 for a week long cruise) and another equal amount that the crew members will divide among themselves. Often additional tips are given to individual crew members for exceptional service. Again, policies are different on different boats for how to pay for miscellaneous charges you may have incurred, such as drinks. Some require cash payments. Check with your cruise line or travel agent. It is suggested to have copies of your passport, airline tickets (if not electronic tickets) and of your Travel Protection Plan. Do not carry expensive jewelry or valuables; you won’t need them. Bring extra money for souvenirs or some other things you may wish to buy. Binoculars are extremely useful to spot birds and wildlife. You may need a head-lamp or an small flashlight. Have fun, enjoy your time in our Paradise. You are going to have a once-in-a-lifetime adventure. Take advantage of every moment and bring back beautiful memories. I'll really prepare according to this blog if i go to the Galapagos trip. Thanks for very interesting and helpful sharing about Galapagos trip. There is no better way to explore the Galapagos Islands than on board a private yacht. Cruising the Galapagos Islands by yacht provides an intensely intimate and personal experience that you will never forget. Take advantage of yacht rentals that are limited to 10-16 people and enjoy a more relaxed and in-depth encounter with nature. Galapagos is known for its marine beauty and sea way is best to explore this wonderful islands. I visited Galapagos during my spring break and that was the most enjoyed vacation for me. I am planning to visit there again.Galapagos has many options such as Rock climbing, Scuba Diving and many more that attract most of the teen tourists. I loved your post. The Galapagos Islands are beautiful. I highly recommend Galapagos Luxury Charters . Hi --- I have a question. My husband and I are leaving next week straight for the Galapagos. We are planning on booking a boat tour once there. I have read that the boat operators want or require you to pay for the bulk of the trip in cash, and may not accept credit cards or may only accept credit cards for a small portion of the payment. Is this so? I just cannot imagine having to take $3,000 plus down there or try to get that kind of cash out of an ATM over a couple of days to pay for our boat trip! Can someone shed some light on this? Hey great post ! I can recommend the Hotel Silberstein which has a very good service and delicious food ! Whether you eat to live or live to eat, there is one thing for sure - you will thoroughly enjoy the city of Brisbane. With several options for cheap Sicily Car Rental, Brisbane is truly a city that welcomes guests with open arms and a suggestion to bring along your appetites. This is a city of gastronomic proportions, and this has been possible because of the amalgamation of several cultures. eToro is the #1 forex trading platform for rookie and professional traders. The third day of tour trip focus on Agra city with jaipur to delhi taxi. Agra, the home land of one among the seven wonders of the world beholds many attractive spots. On this day, you can explore the majestic Jama Masjid, historic Fatehpur Sikri and the great Buland Darwaza built by the Mughal Emperor Akbar. After visiting these dazzling spots in Agra, you can return back to hotel and enjoy your dinner. The post is written in very a good manner and it contains many useful information for me. Thank you very useful information. If you are looking for a cab then hire this: cabs service in agra at very lowest price. This place is special because of the extraordinary nature and fauna. Here the travelers will be pleased with the mild climate and scenic views.